Looking down the garden to the silky oak, every inch of leaf and bark had disappeared under a dense, teeming mass of velvety blacks and browns. This was my first experience of the Bogong (Agrotis infusa), a moth native to the south-east of Australia that breeds and swarms in huge numbers. A species that would, for the next day or so, take up residence at the bottom of our garden. In his series ‘Birthmark’, Owen Leong explores attitudes to people of Asian background in Australia. The nature of their reception, if you like. His visual metaphor is of the Bogong moth; at once emphatically Australian and disturbingly invasive. The images are portraits in which the wing patterns of moths such as the Bogong have been overlaid on the face like a mask. The eyes are deep black pools – alien and inscrutable. The overt narrative, of course, critiques notions of immigration and infestation, and the facile racist clichés that can arise all too quickly in Australia, just as the Bogong descends en mass without warning. 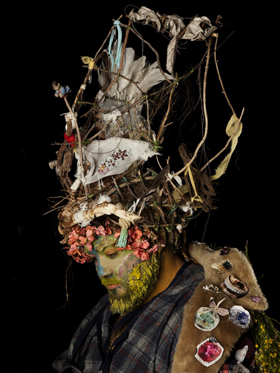 Owen Leong deftly uses the moth-wing mask not to obscure the individuality of his subjects, but to heighten it. Each image elicits a strong sense of the subject as a distinct individual with a personal story. They are attractive, charismatic young people. Some convey an androgynous quality that beguiles the imagination; others display wounds that suggest psychological battles. In this way the bigotry and the reality of human difference are set in subtle contradistinction. The collective ‘otherness’ invoked like a spectre by racial prejudice cannot be sustained when one looks for any time at all, for the uniformity of the generic dissolves before our eyes to reveal that essential human quality of difference. We are all unique; each of us different one from another. That is what makes every one of us an individual and imbues us with a discrete and enduring sense of being that suggests the essential and perhaps even the eternal – a soul. While surfaces transform, masks mutate and scars heal, the humanity that draws us together lies in our collective understanding that we share, at our core, this fundamental variety. It is our very diversity, and the empathy its acceptance creates, that ultimately connects us.